Getting the money is always a challenge with fund raising, as is reconciliation and record keeping. Additionally, it’s beneficial to communicate to the individuals who donate, because they are interested in your program and a great “target market” for the next fundraising effort. Very often, contributions are solicited via social media, allowing contributors to go to a website customized for a specific participant (you want to get that free t-shirt that comes with getting at least $500 in donations!). Donations are made via PayPal or credit card, and it means a live tally can be posted online and various teams can compete against one another to be top fundraisers. But, there’s still a need for checks — both in advance of the fundraiser as well as at the event itself. (See the debate about why checks are better than credit cards). Many times, individuals do not feel comfortable making payments online via a credit card, and certainly not something like PayPal for the more conservative age groups. So, inevitably, they either mail in a check or bring it to the event. 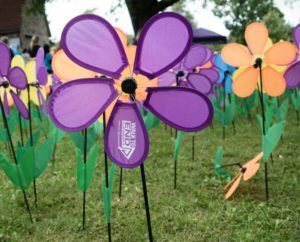 The Walk to End Alzheimer’s holds fundraising walks in communities across the country, and this year they have introduced the ability to accept checks in their app. That means that if a participant gets a check from a contributor who is uncomfortable with online payment options, that contribution can be immediately applied to their running total via an easy entry procedure (basically, take a picture of the check), and no one has to worry about getting the physical check to a collection table at a busy event. Mobile and remote deposit capture technologies are enhanced with the capabilities of Anywhere Validate (see video). Not only can you validate the payment negotiability, correct amount and restrictive endorsements, the donator’s name can be read and stored in a database. Tools like this, helping victims of Alzheimer’s and their caregivers, represent a wonderful evolution in how technology makes our lives better. And, to help Alzheimer patients and their caregivers, please consider contributing to our marketing consultant’s donation page.